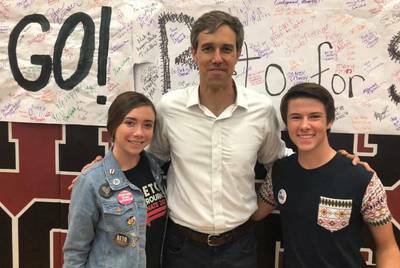 From left: Autumn Lanning, Beto O’Rourke and Bryant Young. For Young, the first wake up call was negative coverage in pro-Palestine media reviving a September tweet in which O’Rourke praised (Young called it “fawning over”) the American Israel Public Affairs Committee, the main pro-Israel lobby group. (O’Rourke recently called Israeli Prime Minister Benjamin Netanyahu “racist”; his campaign said he favors a two-state solution in the Middle East and pointed out that as an El Paso congressman, he regularly met with groups on both sides of the Israeli-Palestinian divide). 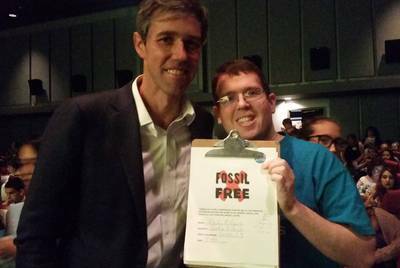 Mickey Fetonte, a member of the environmental group 350 Austin, shows the pledge Beto O’Rourke signed that he would not take campaign donations from the oil, gas and coal industries. Bryant Young and Autumn Lanning. 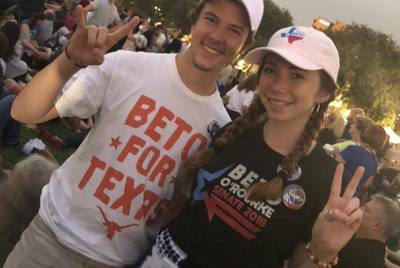 “Why two former Beto O’Rourke staffers now say they’re with Bernie Sanders” was first published by The Texas Tribune, a nonprofit, nonpartisan media organization that informs Texans — and engages with them — about public policy, politics, government and statewide issues.